The new Berkeley soda tax adds about 12 cents to the price of a can of soda and about 68 cents to a two liter bottle. 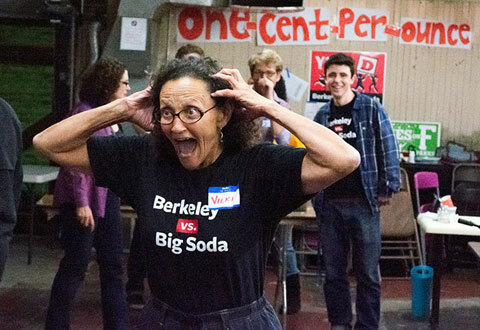 Berkeley made history yesterday as the first city in the U.S. to pass the so-called ‘soda tax’—more specifically, a tax of 1 cent per oz on the distributors of sugary drinks. Across the bay in San Francisco, a similar measure didn’t receive enough support to pass. After Mexico introduced a tax on sweet beverages earlier this year, a majority of Mexicans say they’re drinking less sugary drinks, according to the WSJ. Professor of Public Policy at UC Berkley, Robert Reich, says, “Taxing a product to reduce its consumption is a tried and true public policy.” Still skeptical? The proof is in the nicotine pudding: according to the American Cancer Society, every 10% increase in the cost of a pack of cigarettes has caused a 4% decline in the rate of smoking. Pretty effective, nah? What does this mean for soda drinkers? The new tax adds about 12 cents to the price of a can of soda and about 68 cents to a two liter bottle. Berkley’s Mayor, Tom Bates, explained that the next step is for City Council to work with the Berkeley community to decide exactly how to best spend the revenue from the soda tax on health programs. While there will always be haters, this could be a big first step in the war against America’s obesity and diabetes epidemic. More on that in the video below.